I lived my teenage years in the multicolor explosion of the 60's: the Beatles, Pop Art, oriental mysticism, hippies, psychedelic art, pacifism. . . and the certainty that we would change the world. By age 17, I was studying Fine Arts when suddenly (everything seemed to happen to me suddenly in those years) I understood that it was not my destiny to become a painter or an artist of visual arts in any of the disciplines I was learning. So I tried other techniques such as engraving, gold and silver work, carved furniture, and stained glass. With each experience I was learning, yet still had not found my own mode of expression, the type of technique in which I could feel comfortable expressing myself with the fluidity I was looking for. I realized I did have a certain affinity for working with wood: wood sculpture had been the most satisfying in that regard (and I still often think about exploring that path). 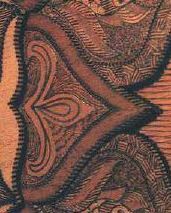 I took some trips and came upon ethnic art of some of the primitive peoples of South America: simple people, people of action. They spared me the debate about the artist's intention and allowed me to focus on explaining (an often ancestral) technique. . . In 1975 (one of so many dark years in Argentina, with kidnappings, assaults, street violence, and repression), on my return from a trip to Machu Picchu, some friends invited me to supper at their house. 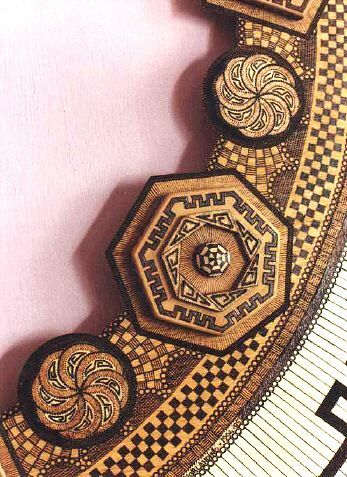 The supper conversation turned to decorative art and the topic of pyrography came up. They asked if I had tried this particular medium and I replied that I had never in my life really even seen a pyrography tool. Then they brought out a pyro tool in its wooden box and invited me to try it out. 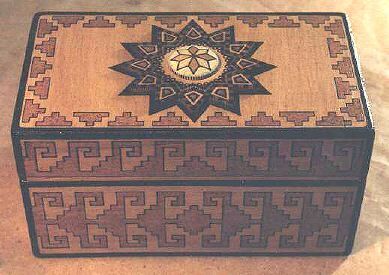 The tool's wood box itself served as the object of my first attempt. It seemed fascinating to me that there was a tool that would allow me to burn wood. Off I went with my borrowed pyro tool, and once at home, I cut a tapestry shape out of a piece of leather--the only material handy--and began to work on it. For years pyrography was a hobby for me. From time to time, a particularly good idea would motivate me to work for days or even weeks to bring it to fruition. Occasionally, something would start well but later get muddled: I abandoned works I considered mediocre when they failed to reflect the mental image that had inspired them. At any rate, they served the purpose of teaching me techniques and procedures. I suppose it's an advantage you have when you can work without being too worried about results--just working on a piece trying to approach that harmony that is so often intuited. But life went on; I continued to wonder how to make the world I was living in a little better. Once into the decade of the 90's, I felt I could no longer be a "weekend artist." I wanted to make a serious commitment and learn by doing. Thus in a few months time, I had readjusted my lifestyle and activities in order to progress in this discipline. It was then that I had a clear perception that I was doing that thing that I had put off for a long time but that I was no longer going to put off. I now feel that my works have gradually improved. That assessment makes me happy, but in reality I believe that the best ones are those that are still there in my mind, waiting for their turn to come. 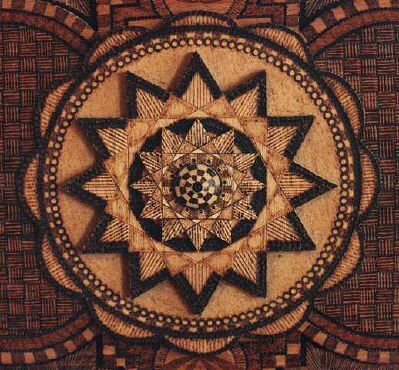 . .
Mandalas are forms that Buddhists utilize as an aid to meditation. 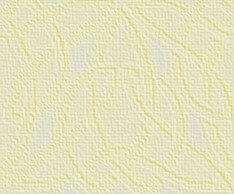 It helps them to focus their attention and stop the flow of consciousness. 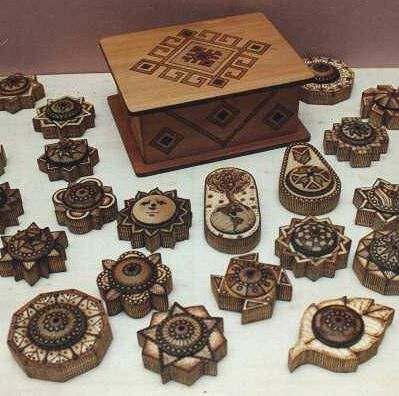 For them the aesthetic is not what is important since mandalas are useful meditative designs and nothing more. For me, they are a pretext for developing forms of the greatest beauty possible, and if they also happen to produce an unaccustomed state of consciousness, so much the better! The incense burners are small bases, each with a little hole designed to hold a stick of incense. 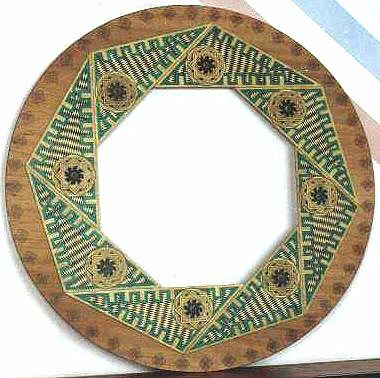 Although not always obvious, mandalas are geometric figures. 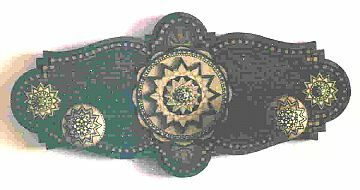 In the case of my works, some of the mirror frames, incense burners, and clothes racks are mandalas, for example, the twelve "flowers" in the Baroque clothes rack with the star [first two images in page] and the incense burners [in the collection immediately above]. I have always been concerned with looking for subject matter that is "Important." When I was very young I used to wonder what I could paint that wouldn't be so localist (the minimalism then that so many others were doing just didn't appeal to me). One day, I was reading a book about Gurdjieff. I was impressed by his commentary on "Objective Art": he said that this form of art was objective because human beings viewing an objective work perceived it in the same way--he gave the example of the Pyramids. Although this commentary wasn't totally clear to me, rationally speaking, it served to drive me to further research. Later, I found myself reading Luca Pacioli and "Divine Proportion" and among the illustrations of that Renaissance book, I came upon his fascinating polihedrons. 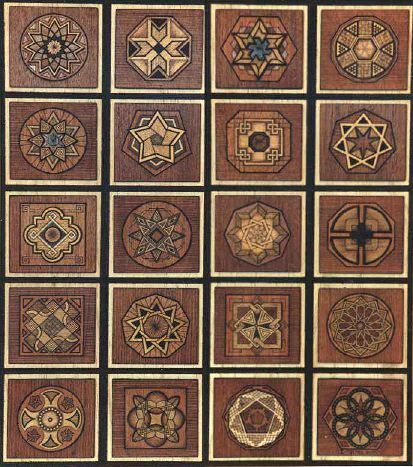 I was gradually getting oriented towards works with geometric forms and while studying the art of Tibet, I ran into the Buddhist mandalas--they're incredible! Anyway, so that's how I came to enjoy working in geometric forms, although I resolve them in quite a baroque way. . . (by "baroque" in this case, I mean that I like works that are heavily detailed; when I am working I often have the sensation that something is missing, and then I keep adding a lot of minute details. I used the word "baroque" in the sense of elaborate). The pyro tool I use has the impressive name of "Industrial Pyroengraver B-408." In Argentina there is only one company that manufactures these tools; it differs from other models that I have seen on the internet: the handle is shorter, lined with cork and very comfortable, although after using it for a while, it starts to burn the artist's hand mercilessly. The points have a different system as well. My process is the following: First I do the design and then I cut some shapes; sometimes I replace one type of wood with another, looking to contrast or emphasize colors: the yellow ochre of oak is quite different from the light color of spruce or the brown of cedar, for example. 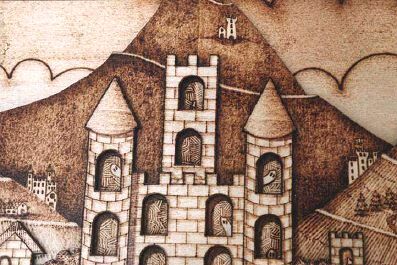 My pyrography gets confused at times with inlay because, indeed, I do work in great detail; however, it is solely burned wood. I don't use color too much because I don't consider myself a colorist really. I can ruin a work by using a bright palette; fortunately my wife usually moderates my chromatic struggles. I work with acrylics because they don't demand too much skill. Some of my designs are not mandalas but mandorlas, which are made up of two equal arcs connected at the vertices. The mandorla is a form that appears in Christian and Judaic iconography. It is a symbol that represents opposing "tensions" (such as body-soul or material-spiritual). Another part of the inherent concept is that our road to spiritual development eventually resolves this opposition. Precolumbian Art: Although I must say that the mandalas are my favorite designs, recently I have been learning more about precolumbian art and ethnic art in general and am finding some extremely fine works for inspiration. Naive Art: As a break from working with so much geometry, proportions and varied rigid disciplines, from time to time I enjoy working on a project in the style of naive art [see the clothes rack and its detail in the third and fourth images from top]. I wanted to do those mate gourds with some nice pyroengravings on them for my friends, but it didn't go at all well. The pyroengraving looked very imperfect to me and I threw them away. From that experience I came to the conclusion that you can't pyroengrave on gourds. Some months ago, navigating through the E-Museum, I came upon the works of Opie and Linda O'Brien among which were some magnificently pyroengraved gourds! How can they do that so well and I can't (I said to myself). So I went back and tried again with the gourds, and this time they came out pretty well. Right now I am working on some more gourds, and I am delighted with this material. 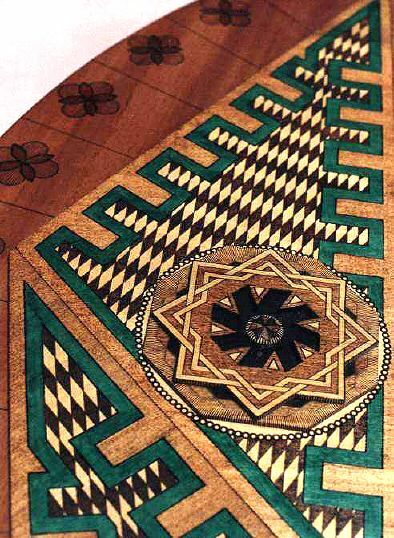 Diógenes has taken the study and application of geometric designs to an amazing level. 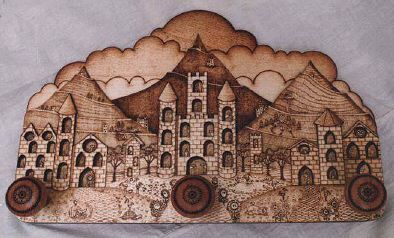 Look for more extraordinary examples of his work in the E-Museum of Pyrographic Art. Diógenes Giorlandino's mastery of this specialized area and his own creative input into what is generally a traditional realm is remarkable. He found a niche for himself and then carved out a new one--in terms of both the originality of his work and the medium he chose for it--that has only his name on it. And it's a remarkable name, too. 2001, Kathleen M. Garvey Menéndez, all rights reserved.